MF02 is +1000 M light, that put it in the thrower class with plenty of reach for my needs. But clearly i haven’t seen anything yet when it comes to throwers but the next class up mostly seem to be too impractical to me with the “much” larger heads. Outside of fun i am having a hard time seeing what i could use such a light for, i am not going search and rescue for sure, and even if i did i cant see why my U21 or MF02 should not be enough for that. Could also just be the pictures of the big lights that mess with my brain and when i get to hold one its not so bad after all, i do have big hands myself to match the rest of my 1.9 M size. @ M4D M4X: Looking good!!!!!!!!!!!!!! SparkyDK: I have throwers from pocketable for the holiday (Sunwaymen T25C - 160Kcd) up to Nitecore TM36 Lite (dedomed XP G2 849Kcd) and, more recently, the BLF GT. The latter two do not go with me on holidays – my wife would kill me – but they are great to have and play around with. Especially during the German TLF Forum’ annual meetings. This Astrolux I want to have so I can modd it with either Osram Oslon BF or Ostar Q8WP. Probably the latter. With that (proper focus & centering will be the issue) it could reach up to 2Mcd. 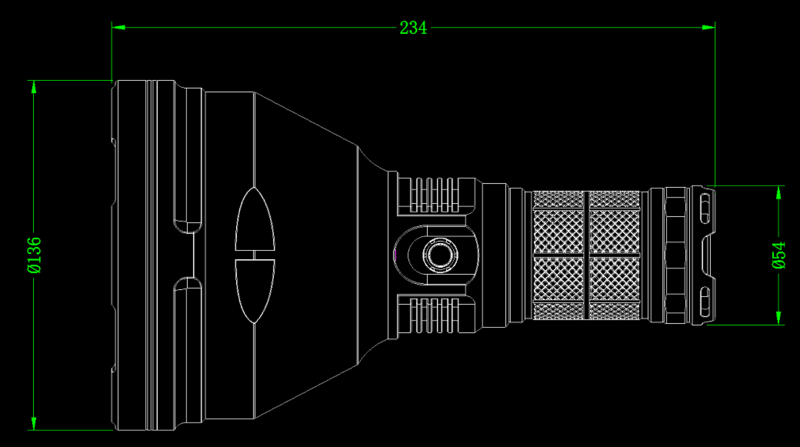 Hmmm… I adjusted the image for 1 to 1 scale and over imposed my GT to compare, it seems that it may have a deeper reflector than the GT… Interesting, do you have the actual dimensions of the reflector? Thats what i would expect it to ship with, without knowing too much about this addiction those seem like a good idea for emitters on a devise like this. Unsure if that will screw up the prize,,,,,,, it probably would. I do find my MF02 do fine for my needs, so the MF04 have to outperform it by a good margin, or at least have a really good prize for me to double up on the long range arsenal of mine, after all i only have 2 hands and my backpack are only 35L as i like to travel light. Sherman, you have to have a bit more patience. New flashlight designs can move pretty slowly. If there’s no new updates in 2 or 3 months, then there might be a problem. If you expect everything to move fast all the time, you will just be disappointed. 1.4M … I’ll believe it when I have one in my own hands. They are using the same exaggerated specs as the MT35/MF02 (2,700 lumen) so you know the candela is exaggerated as well. It looks like it’s using the same 2S2P carrier as the earlier lights which means it’s probably is using a boost driver. Maybe the same as the smaller light? I would think so. I guess the only way to know what your getting is to wait for someone to review and spec the light before you go buy one. This could be just a mf02 with a larger reflector. Not that this spell all doom and gloom, at least now we will see that doubling up on reflector size do. But i must admit i was hoping for a little extra spice in form of new interiors like other carrier and driver and LED to match. I dunno i remain healthy skeptical cuz everyone should be that with everything, and leave the always happy to the potheads and crackpots. $110 for the head alone? Could be worse. Can you make out the prices? What is the total light cost and is it free shipping or what amount is the shipping cost? Edit, it looks like the whole light is $125, but I can’t imagine that low price would include shipping. I think it’s with shipping, within China. BTW, Regular price of MT35 Plus (aka MF-04) is ~$125. Regular price of MT35 (aka MF-02) is ~$111. The GB price of MF-02 was ~$78. Scaling the price linearly, GB MF-04 would cost less than $90. I wouldn’t be so optimistic, but maybe $100 is possible…. That’s not the retail price on Taobao. It’s a big discount for preselling of the first batch. I just checked, at the time of MF-02 GB, MT35 went for $64 from Taobao with orders of 50+ items (+shipping). It’s now $83 (I assume +shipping). Is it the expected release date ?